If you ever sit around with your friends making a list of movies that you would want on a deserted island, The Hangover is at the top of my list. And, unlike most, I enjoyed all three movies. Black Doug is an American black ale (or cascadian dark ale if you prefer) that pays homage to the Hangover and Mike Epps‘ character sharing the same name. Black Doug takes inspiration from Wookey Jack by Firestone Walker Brewing Company, one of the smoothest and best black ales available. The darkness to the beer is obtained by Carafa III, giving color without the astringency of other dark malts. A touch of chocolate rye adds some depth to the beer that can be obtained from the Carafa along. Still, the question begs: why brew a beer that is more of a fad style? I like a good American black ale and I love hops. I needed some variety to all the east coast ipas that I have been brewing. The biggest thing I did to this beer to make it different from other American black ales, I decided to use east coast ipa hopping process: lots of late hops with dry hopping occurring as primary fermentation begins to slow. Otherwise the beer followed a normal brew day. Enjoy! 2017-03-12 (morning): @63.0*F, slow fermentation. 2017-03-12 (eveningg): @63.0*F, added heat blanket set to 68*F.
2017-03-18: Bottled with 3.75 ounces of priming sugar and 2.0 cups of water. 25, 22 ounce bottles. Bottle crown label: BD. Useless Fact: It would take you 10 years to view all the photos shared on Snapchat in the last hour. 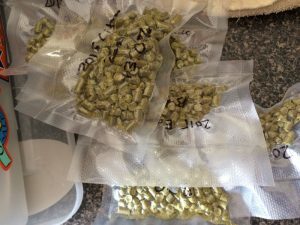 This entry was posted on Saturday, March 11th, 2017 at 1:04 pm	and is filed under Beer Recipes, Home Brewing. You can follow any responses to this entry through the RSS 2.0 feed. Both comments and pings are currently closed.